It might not be the most glamorous of market sectors, but there's business to be done in the large people carrier market. 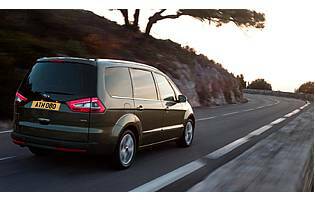 Ford's Galaxy has been designed to offer the best of both worlds; it can be an upmarket family holdall or a spacious and refined mode of transport for business duties. The stereotypical executive saloon is what you'll see most of the time transporting business people. However, when you need more room there's little on the market that combines the same level of refinement but doesn't look and drive like a van with windows. 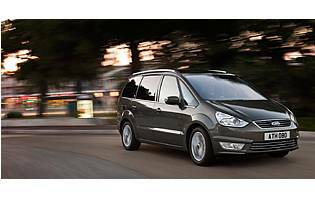 Ford's Galaxy offers that hard to find compromise. Since Ford moved on from the first generation Galaxy and its more mass market family approach, this second generation car has won the hearts of shrewd business types seeking a versatile executive holdall. It could be the airport run, hotel shuttle or a pre-booked chauffer service. Either way, this Galaxy has found favour with many. You might struggle to spot the changes on this revised model, but that's a testament to the fact that Ford got so much right first time around. A general sharpening up of the car's exterior is just about evident, while the already polished interior has been improved. Subtle tweaks to the way the car drives has resulted in a more composed ride. The big news is the updated engine range, which includes a new 2.0-litre petrol unit plus a collection of revised diesel motors. The 'Ecoboost' petrol engine offers above average performance, but not at the expense of fuel economy. The diesels, which are expected to form the bulk of sales, combine low emission and fuel consumption, making them ideal for the cost-conscious owner. Factor in a DSG-style dual clutch gearbox and the Galaxy offers everything a traditional premium saloon has. For all the razzmatazz that surrounds the likes of ford's Focus and other mainstream models, although they are exceptional products the firm's Galaxy is no less impressive. 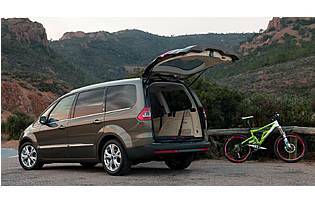 Liked by private and business users, the car's spacious cabin and car-like road manners allows it to rise head and shoulders above the less rounded, van-based competition. It might be more expensive than an S-Max, but if the right model is chosen it doesn't have to be a financial disaster. Unless you specifically need the added refinement of a petrol variant for executive chauffeur duties, diesel is the way to go. And with the various trim levels not short of standard equipment, there's little need to go mad and tick all the options boxes. As you'd expect from a car in this class, the Galaxy boasts plenty of cabin space and numerous oddment storage options. The car's Fold Flat System works well, enabling the second and third rows of seating to turn into a flat load floor without having to remove them from the vehicle. And with just the third row folded, there's a good balance of passenger and luggage space. Anyone familiar with the Mondeo or the S-Max should have no problems getting comfortable with the Galaxy. The various dials and displays wouldn't look out of place in an Audi, and basing the steering wheel-mounted controls on a mobile phone's toggle switch is a masterstroke, dispensing with the need to wade through a manual before taking the wheel. With its plush interior, supportive seats and plenty of space, the Galaxy's cabin demonstrates a level of comfort and refinement that exceeds its asking price. And, although the Galaxy isn't as streamlined as a conventional family hatch, road and wind noise is minimal most of the time. You won't find any corners cut here, with a comprehensive immobiliser package plus a keyless ignition system for maximum peace of mind. And with plenty of covered storage options plus a sturdy rear load cover, nothing's been left to chance. Vehicles, like the Galaxy, which are tasked with carrying people need to be fully equipped with the latest kit for practical and confidence enhancing reasons. There are front, side and curtain airbags, plus a driver's knee bag, while the electronic stability aids plus a useful blind spot warning system all add to the feeling of being safe. Although there's talk of minor changes to the car's ride and handling qualities, there's nothing really wrong with the Galaxy. For what is a large vehicle, it behaves very much like an overgrown family hatch. Accurate steering, a plush ride and very little roll all make the driving experience a pleasant one. The engines are also first rate, with the high-end diesel a particularly good option. It might be a people carrier but the Galaxy is positioned a notch or two higher that your average family holdall. As such you might not want to leave small children and their sticky fingers to their own devices. The Galaxy makes more sense as a car for the grown-up family – if nothing else teenagers will likely sow more respect towards the plush upholstery. Don't let the Galaxy's size put you off. Although large, if have a growing family there's little chance of buying a smaller vehicle so it's good to know that it's an easy car to drive and park. Once very much a family holdall with modest utilitarian leanings, this second generation Galaxy is a very different beast. With its plush cabin fittings and a more businesslike appearance, the car inhabits a more upmarket part of the world. For some, however, the presence of the familiar Blue Oval badge is a barrier to ownership – Ford's mass market image is a tough one to shake despite the Galaxy's Germanic interior. With its wide opening doors, realistically there's no barrier to accessing the Galaxy's cabin. Even the raised seating positions shouldn't pose any major problems for the vast majority, although those less able might struggle with the distance from the kerb to the seat. At the rear, the car's sizeable tailgate does require a determined pull to shut. Along with the Galaxy's newfound premium positioning, the car's audio unit delivers a sophisticated sound and has no problems filling the cavernous interior. Significantly, you have the ability to connect an MP3 music player, while the sat-nav option complete with colour touch screen offers an easy to use interface. As a car popular with the business community, subdued exterior colours work best. The Galaxy's subtly revised exterior adds a modern look but one that's unlikely to upset conservative passengers. The big surprise is the cabin, which has the look and ambience of something more expensive - the use of high quality plastics and upholstery is a pleasant surprise. Despite its size, the Galaxy is rarely a challenge to park or manoeuvre in a confined space. Its lofty driving position is a bonus, while the steering boasts plenty of assistance. As you would expect, parking sensors do a good job of making life easy. Petrol engine options – 2.0-litre (145bhp); 2.0-litre SCTi (203bhp). Diesel engine options – 2.0-litre (115bhp, 140bhp, 163bhp); 2.2-litre (175bhp). Transmission options: six-speed manual gearbox, plus option of DSG-style auto gearbox for selected models. Trim levels: Zetec, Titanium, Titanium X.